Many dogs who need to wear muzzles are also fearful of hands reaching, touching and restraining them on the face, ears and snout. It’s a frustrating irony; after all, most muzzle training plans require guardians to do at least one of those things. No matter how strong a positive association a dog has to the muzzle itself, if he is uncomfortable with someone reaching around to buckle the strap or adjusting the muzzle on his snout, he’s not going to feel completely safe. Depending on the severity of the fear of reaching and handling, the dog’s positive association to muzzle training can erode over time, even if the trainer was diligent in desensitizing the dog to the actual muzzle. Fortunately, it’s possible to teach dogs positive associations to reaching hands and handling around the head before worrying about buckling straps or placing the basket over the snout. The following videos demonstrate how to prep a dog for muzzle training, ensuring a stress-free and fear-free session. The Muzzle Up! Project is excited to announce its newest branch of services for veterinary clinics across the world: The Veterinary Partners Program. Once clinics complete these webinars, they will receive certification from The Muzzle Up! Project and follow-up materials for staff and clients. Clinics who complete the program will be eligible for in-person seminars and staff trainings, and will receive a quarterly newsletter containing staff and client training tips, updates on best practices, and interviews with clinicians. To stay informed of the program’s launch , sign up here. For questions, contact the Muzzle Up! Projects director, Maureen Backman, at muzzleupproject@gmail.com. Ellie, eagerly anticipating her muzzle training session. Ellie’s guardian is Cara Lynne Moynes, owner of Pup Tent in Toronto, Ontario. This spring, I launched Muzzle Up! Online, an online training program to coach dog owners through the muzzle training process, giving them real-time support to ensure peace of mind and a successful training process. The initial launch has been nothing short of inspirational. Many of my training colleagues have been gracious enough to participate in the program with their own dogs. Many of these dogs are fearful, whether it be generalized fear and anxiety, resource guarding, handling sensitivity, or previous scary experiences with muzzles. Not all of the dogs participating in Muzzle Up! Online’s initial launch need to wear a muzzle for public safety. Not all of them have a bite history, or a history of dog- or human-based aggression. Their humans are participating in the program because they want to refine their muzzle training skills and want their dogs muzzle trained as a preventative measure. And, most importantly, they want to increase their trusting partnership with their dogs through a force-free training experience. 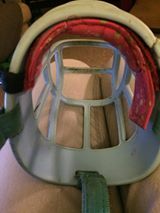 “When folks ask why I’m muzzle training sweet little Ellie, sometimes I mention her bite history, sometimes I mention prevention and liken a muzzle to a seatbelt or helmet, and other times, I show them photos like these. Cara and her dog, Ellie, are an excellent example of how muzzle training has benefits beyond safety and prevention. Because Cara and I are training Ellie using the principles of counterconditioning and desensitization, she has been comfortable and happy during each step of the training process. Ellie is elated when she sees her muzzle, because she knows, through gradual training, that she will have a fun and safe experience (and also get lots of liverwurst). For other fearful dogs, muzzle training further helps them develop confidence. They learn new skills, continue making positive associations with their environment, and engage in games and activities that promote positive associations. What sets Muzzle Up! Online apart from basic muzzle training is the use of parameters and games so that dogs not only tolerate wearing their muzzles, but enjoy wearing them. Many plans end with putting the muzzle on the dog, when in fact securing the buckle of the muzzle strap is just the beginning. 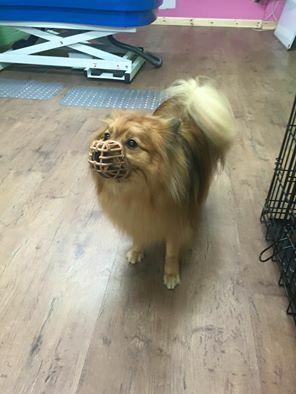 After all, just because a dog is OK with wearing a muzzle for a few seconds doesn’t mean he has learned to play, run, or interact with the environment while wearing it. Muzzle Up! Online addresses all these factors, using the principles of operant and classical conditioning to facilitate play, loose and comfortable body movement, and teach a variety of games and activities. Together with the dog’s humans, I use the dog’s favorite motivators to make muzzle time rewarding and fun, whether it be fetch, soccer, nose work, or simple agility moves. 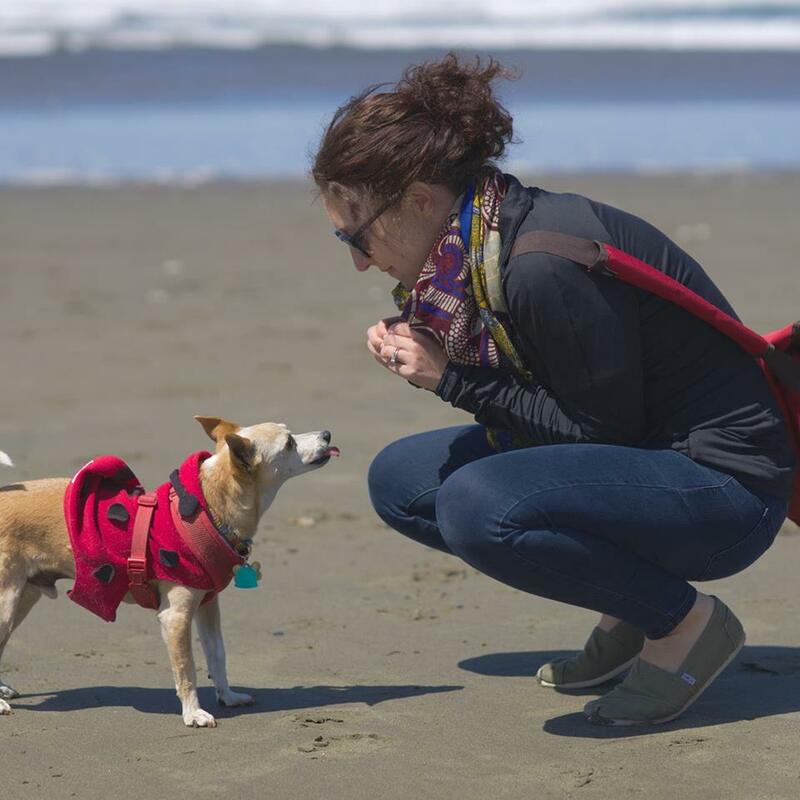 Many thanks to Katie Grillaert, CBCC-KA, CPDT-KA, CBATI, of Fetch Dog Training and Behavior for this guest blog post. Grillaert, who specializes in training fearful and aggressive dogs, also started a community initiative called Fetch-for-Fosters, dedicated to educating people about the importance of training and to providing low-cost training services to rescue dogs. Dog-industry professionals are working hard to change the public perception for muzzles. Trainers are teaching how to teach your dog to love the muzzle through a simple “treat basket” exercise. Behavior consultants are emphasizing how muzzles can improve the quality of life for dogs that are fearful, aggressive, or have pica. And veterinarians appreciate the added safety of a muzzle-trained dog during medical emergencies. But owners are often hesitant to use a muzzle on a regular basis. From personal experience, I can vouch that they’re missing out on the benefits of a great tool! As a certified behavior consultant, I work with a lot of fearful and aggressive dogs – dogs that have a bite history, and dogs that are a bite risk. I teach all of my students how to muzzle train their dog and I provide strict recommendations regarding when a muzzle should be used. And I tend to be on the conservative side of things – I’d much rather go slow, wear the muzzle a little more often and a little longer than necessary – than to put the dog’s life in jeopardy due to a bite incident. I’ve fitted muzzles to many dogs, and I’ve trained my own dogs to wear muzzles. 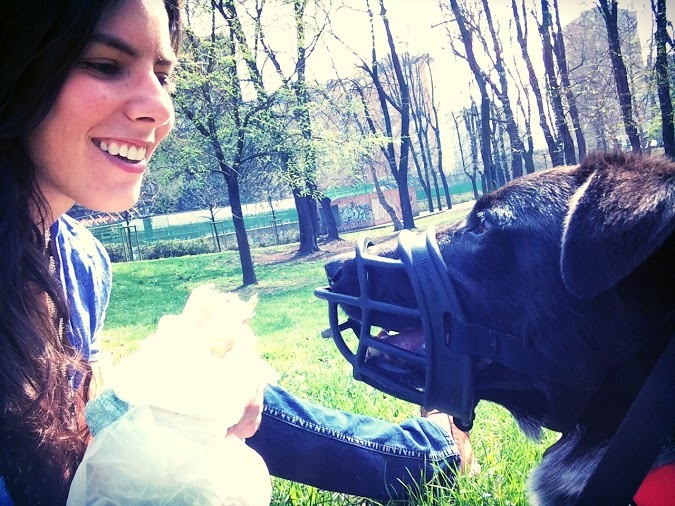 But I hadn’t personally needed to use a muzzle in public with my dogs until I moved to a major metropolitan city. Before the move, I planned my behavior modification plan carefully, and decided that my fearful/aggressive Border collie mix, Oliver, would wear a muzzle at all times in public while we were transitioning to a new environment. I didn’t know how many off-leash dogs to expect, I didn’t know how many children or bicycles would come bearing down upon us without warning. I didn’t know if lots of people would try to pet him and how he would react to people stepping out of buildings onto the sidewalk right in front of him. And I knew that despite my best intentions, I wouldn’t be able to look around every single corner to check for a dog coming straight in our direction. I knew Oliver would undoubtedly be experiencing higher levels of stress for the several weeks (or months!) due to the great environmental change, and I didn’t want anything to go wrong. It’s worth noting that others in this situation may choose to consult with a veterinary behaviorist as well, to discuss if a medication would be helpful during this transition. Ultimately, I decided not to pursue this with my dog right away, although it always remained an option should he have difficulties. So, we set out on muzzling for our daily tasks – every elevator ride, potty break, and walk down the street. And while some people opined that wearing the muzzle must be so difficult for Oliver, he paid it little mind. The biggest difference the muzzle made? It was in me, which came as quite a surprise! 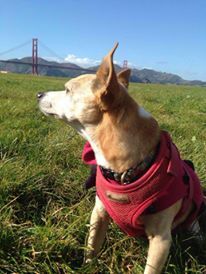 I regularly help people develop personal techniques to be calm while handling their reactive dogs, and I coach leash handling and body posture that further contribute to calm communication. I would often initially have better results with reactive dogs than their owners did, simply because I was more relaxed than the owner. I wasn’t too worried about my skills handling my own dog. But now, as my own “coach,” I discovered a huge improvement thanks to a mental exercise that I didn’t know I was missing! Since I didn’t worry about my muzzled dog injuring anyone, my brain allowed small muscles in my body to relax – muscles I hadn’t even been aware were tense. Maybe I even reduced my own production of cortisol, a primary hormone produced in response to stress. How did I notice this? Well, my dog told me. 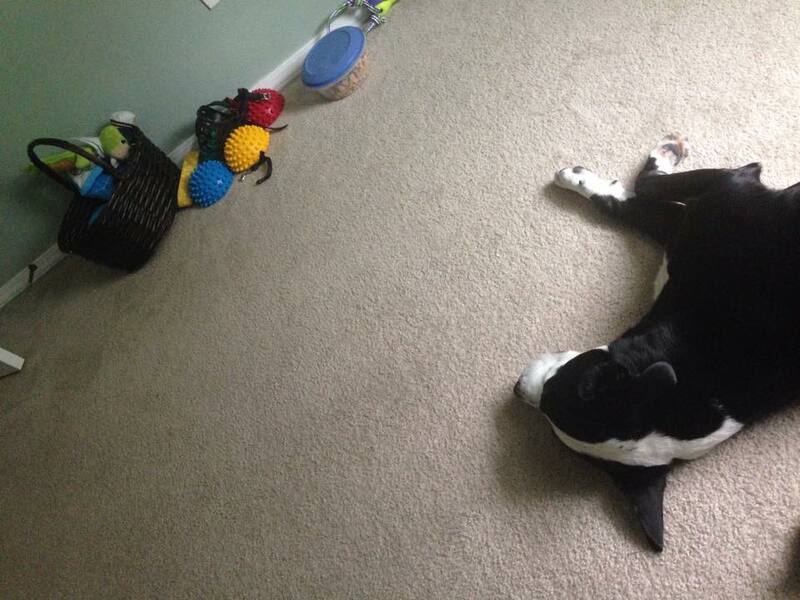 Dogs are incredible observers of human body language, and Oliver could detect a difference. If I was a bit stressed, it probably caused him to think that there might be something worth being a bit stressed about. By regularly wearing a muzzle, going outside became less stressful for both of us, and we enjoyed our time together more. Of course, I still prioritized proactively responding to our environment, but my subconscious (or conscious!) worry was greatly reduced. Now, this isn’t exactly new. Most trainers will tell you that owners are always more emotional when handling their own dogs. 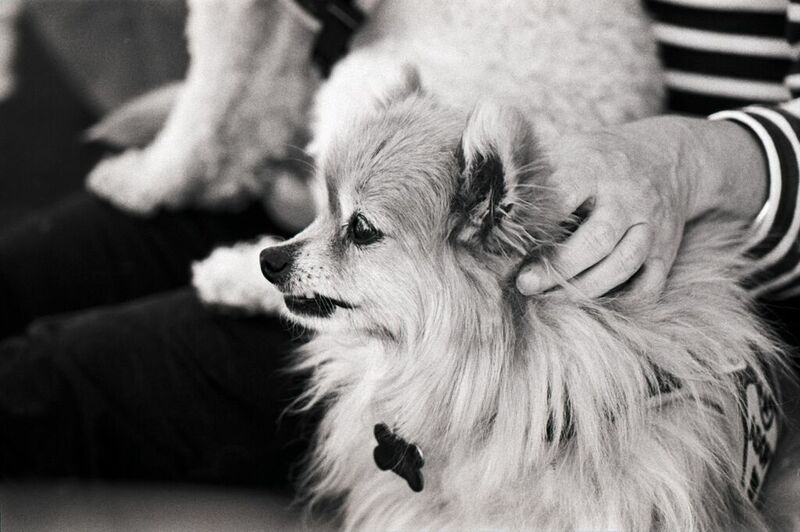 Often, owners can swap dogs in a reactive dog class, and the dogs all seem to behave better! Maybe you feel like you personally aren’t emotional – but you have a mental preparation to use a leash pull to keep your dog away from trouble. The simple act of planning this strategy in the secondary motor cortex likely causes a skeletal-muscular preparation and – you got it – an increase in tension in your body. So, I challenge you to “hack” your brain and take my Two Week Muzzle Challenge. Even if you think you’re not the type of person who needs it – you’re cool as a cucumber. Even if you think your dog doesn’t really need to wear one. First, spend the time to properly desensitize and train your dog to wearing the muzzle. Then, use it every time you go out in public, for two weeks in a row. 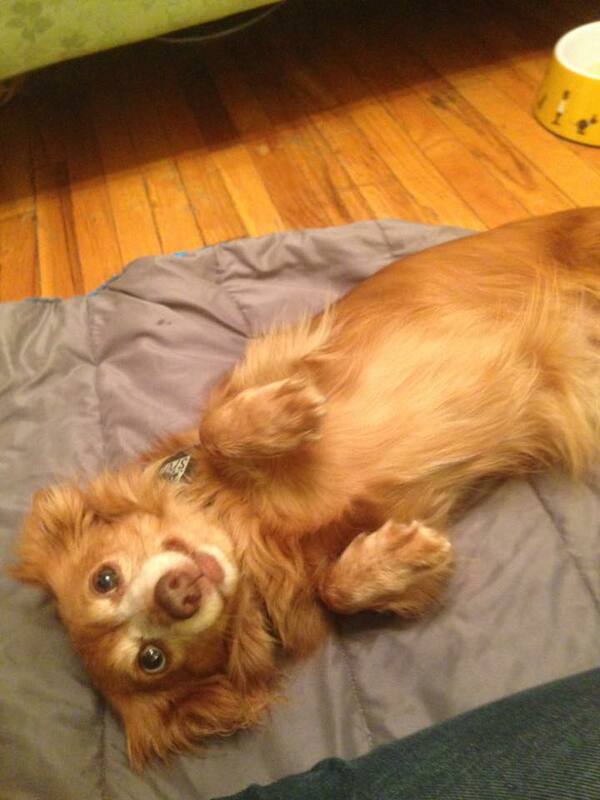 Consider keeping a short journal of your dog’s behavior and your emotions. Give this a try for two weeks and you might be pleasantly surprised with the results. Even armed with my professional skills, I think that this simple mental trick helped me to guide Oliver and improved his progress. And now, I am so thankful to share many experiences with him – taking the train, relaxing at the park, having dessert at the coffee shop – stress free for both of us. – The Muzzle Up! Project promotes safety and education on muzzles and dog behavior, provides online muzzle training and support, and aims to reduce the stigma associated with dogs who have to wear them. For many dog owners, finding the best muzzle for their dog often involves modifications, whether to prevent skin chafing, provide a more secure fit, or ensure more efficient delivery of treats. The following is a compilation of resources to help you create the most comfortable fitting muzzle for your dog. If you are still searching for a muzzle, take a look at our equipment guide, and check out our Facebook page for frequent updates and more photos from our supporters. – Boot liners from Ruffwear, cut up into strips for either the straps or plastic portion. We love this fabric because it’s breathable and quick-drying, perfect for dogs who spend a lot of time outdoors. – If using a Baskerville muzzle, soften the plastic by placing the muzzle in hot water or put it through a full hot cycle in the dish washer. This helps the plastic chafe less and makes it more pliable. An example of muzzle padding from supporter Laurie Thomson. – Moleskin wrapping (for either the plastic or the straps), available at most health stores and on Amazon. – Replacing the nylon straps with leather or soft cording for dogs whose skin becomes irritated with the common nylon options. – Duct tape wrapped around the basket of the muzzle (also great for muzzle art!). – Memory foam or gel foot pads for use on the plastic portion to prevent rubbing and chafing (examples here and here). 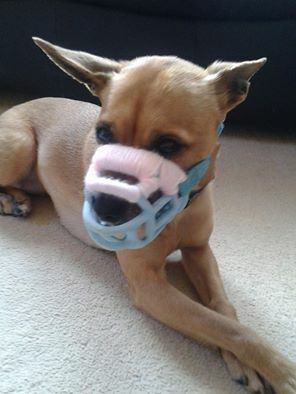 Photo of Simba wearing modified muzzle for easier treat delivery, from supporter Victoria Maclennan. – Cut out the front portion of the Italian basket muzzle, seen in the photo to the right. – Use soft treats like peanut butter or cream cheese and deliver through a squeeze tube.